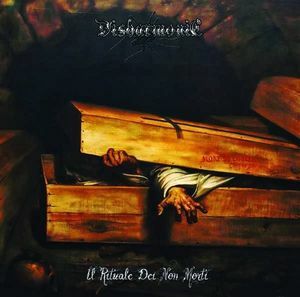 Disharmonic are a band from Italy that plays a very occult and ritualistic form of black/doom metal and this is a review of their 2014 ep "II Ritual Dei Non Mortis" which was released by Beyond Productions. A very slow, dark and melodic sound starts off the album along with some grim vocals and screams as well as some solos and leads that also bring in a good amount of melody and once the riffs kick in the music goes for more of a black/doom metal sound which also brings in clean singing vocals and chant s at times that also gives the songs more of a ritualistic feeling. At time s spoken word ritualistic parts can be heard in certain sections of the recording along with one of the tracks being long and epic in length and all of the songs stick to a very slow and ritualistic musical direction and at times they also add in some experimental and avant garde elements along with a small amount of synths and all of the musicla instruments have a very powerful sound to them. Disharmonic creates a style of black/doom metal that is very grim, ritualistic and occult sounding as well as being very avant garde and experimental at time, the production sounds very dark while the lyrics cover Occultism, Witches, Evil, Spirits And Hell. In my opinion Disharmonic are a very great sounding occult and ritualistic mixture of black and doom metal and if you are a fan of those musical genres, you should check out this band. RECOMMENDED TRACK "Ritual Dei Non Morti I". 8 out of 10.